The KDP Rankings are discussed in more detail in the Round 6 (2018) article. The top 2 Key Defenders are selected on-field in The Weekend Preview's All-Australian Team. The HBP Rankings are discussed in more detail in the Round 8 (2018) article. The top 2 Half Backs are selected on-field in The Weekend Preview's All-Australian Team. The top 2 Back Pockets are selected on-field in The Weekend Preview's All-Australian Team. The Ruck Rankings are discussed in more detail in the Round 12 (2018) article. The Number 1 ranked ruckman is selected on-field (and the runner-up on the interchange) in The Weekend Preview's All-Australian Team. The top 2 Inside Midfielders are selected on-field (and a 3rd on the interchange) in The Weekend Preview's All-Australian Team. The top Pressure Midfielder is selected on-field in The Weekend Preview's All-Australian Team. 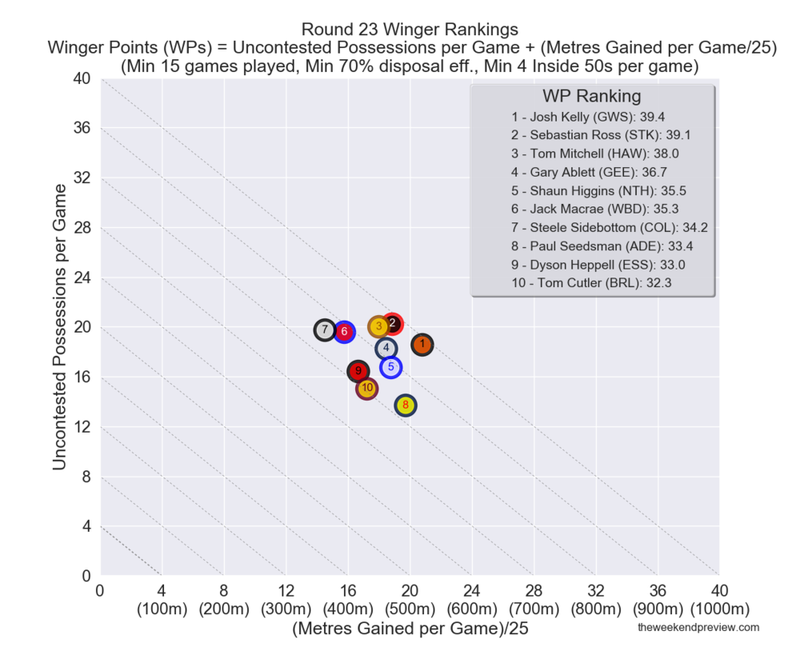 The WP Rankings are discussed in more detail in the Round 10 (2018) article. The top 2 Wingers are selected on-field (and a 3rd on the interchange) in The Weekend Preview's All-Australian Team. The KFP Rankings are discussed in more detail in the Round 11 (2018) article. The top 2 Key Forwards are selected on-field in The Weekend Preview's All-Australian Team. The top 2 Half Forwards are selected on-field (and a 3rd on the interchange) in The Weekend Preview's All-Australian Team. The Weekend Preview's All-Australian Team is populated by considering the position specific rankings.